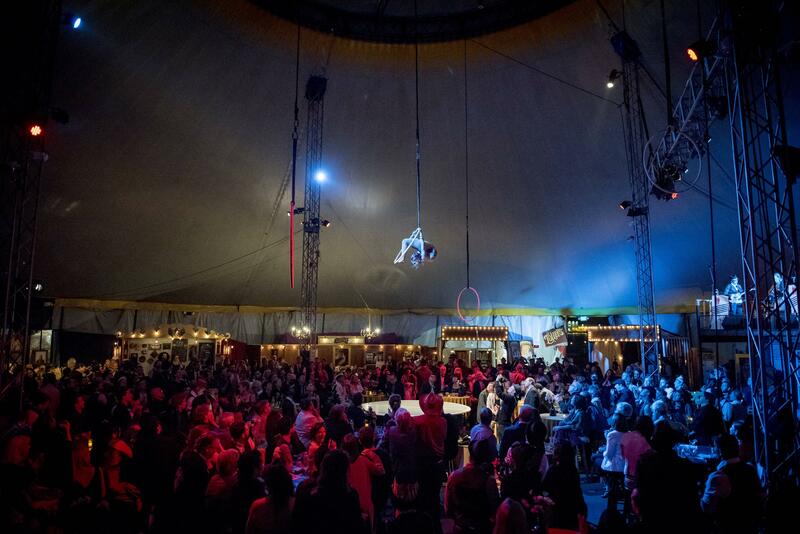 Resident aerialist Stephanie Bailey performs over a packed house during The Vau de Vire Society’s debut of “The Soiled Dove” under the Tortona Big Top. Photo Credit: Leori Gill. There is a sudden danger to approaching a mirage with open arms. The best practice I have found when dealing with an illusion is to question everything, lest one be ensnared in a loss of reality. So why is it, that when I entered the Tortona Big Top on the point of Alameda, I retired my insight, and left open my eyes? Simple: everyone knows a fool has much more fun at the circus than a skeptic. “The Soiled Dove,” produced by The Vau De Vire Society, might just be my last glimpse, for a while, at what my foolish mind can fathom when checking its sensibilities at the tent door. I was therein greeted with a seeming trespass, not upon a place but a time, as the Vaudeville setting played the corners of my mouth through my heart. The early clientele with dinner tickets were spoiled with bits of indulgence. If it wasn’t salmon bruschetta with capers and golden raisins, it was eggplant bisque with lemon and parsley served in endless miniature mugs as if tending to a savory tea pre-party. The jovial nature of the opening crowd bounced up and down the bar line that served four signature cocktails and crates of champagne by the bottle. The first course for the dinner portion, a stone fruit salad with lemon balm and tea leaf sauce paired well with a man doing handstands on awkwardly stacked chairs. My jaw, already hanging low at the spectacular fashion of circus antics, easily welcomed the main course of slow cooked pastrami with corn grits. As dawn approached and the bay wind began to whip the tent, the dinner closed out with a chocolate custard with marshmallow and cinnamon cracker crumbs. Within the forbidding shackles of night the crowd filled up and began hooting and hollering at every sight of aggression against gravity and normalcy. The hair had gone up and the ties came loose with the barman’s whiskey pours. There is a shock to the senses that surround sound in a circus tent can bring. The orchestra, or Jazz Mafia Musicians, were raised and ever awake on the roof of a faux building to the left of the stage. They played loud brass that demanded attention and never asked. For the next three hours I felt greedy with all the corruption I deemed worth keeping. Amidst aerialists that made me want my pilots license, I found great joy in bearing witness to crimes committed by men in suits and women in corsets. 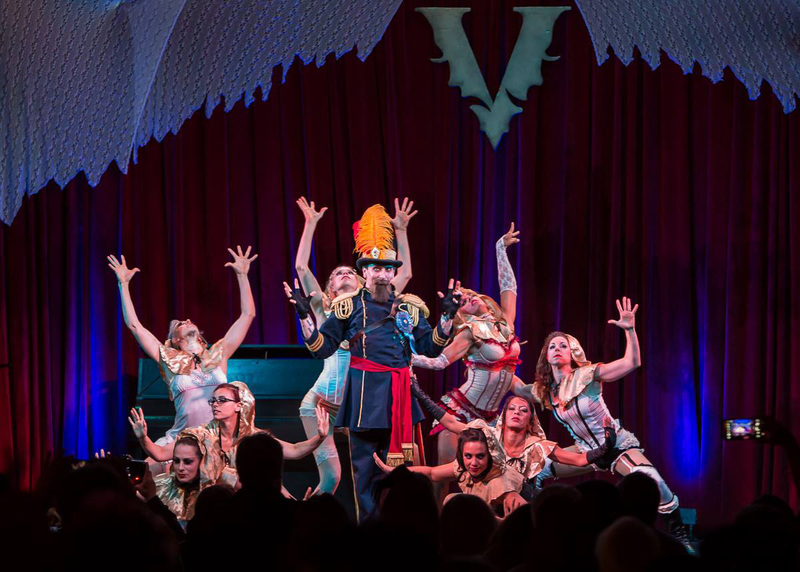 The Emperor Joshua Norton I, played by the irresistible Klown MeeZee, dazzles the crowd in Vau de Vire Society’s “The Soiled Dove.” Photo by Misha . If the legend of the Barbary Coast is haunting San Francisco then “The Soiled Dove” is raising and exercising that very ghost. This invocation came complete with a cameo by the famed prophet Emperor Norton who famously commanded the Bay Bridge’s existence a hundred years before its production, at a time when the notion was deemed preposterous. The show does very well to leap from stage to center round then back upon the bar. Without arranged seating the freedom to roam leaves the audience with a stolen sense of engagement. “The Soiled Dove” succeeded in building a small lascivious town, and as it razed my boundaries I collected my citizenship with my admittance ticket. “The Soiled Dove” plays at The Tortona Big Top in Alameda through July 1st. For further information, click here. Clown: Angela Mae Thompson. Acrobat: Brandon Kazen-Maddox. Straps: Cassandra Cornell. Straps: Danielle Sexton. Contortionist: Dwoira Sheffer. Aerial Rope: Eka Malboeuf. Contortionist: Elliot Gittlesohn. Lyra and Hoops: Erin Shrader. Cyr Wheel: Jacob Haslem. Emcee and Accordion: Jasper Patterson. Burlesque: JB Locklear. Juliano Wade. Ensemble + Can-can: Kelsy Hiyakumoto. Pole + Can-can: Kirsten Gerding. Aerial Silks: Kristin Robson. Chair Dance + Can-can: Leah Colecchia. Margaret Powers. Chair Balancing: Mathew Methner. Acro-balancing: Miguel Balderrama. Natalie Briggs. Rebecca Feller. Acrobat + Sword balancing: Stephania Lindsay. Lyra Contortionist: Stephanie Bailey. Sharpshooter: Victoria Nicolson. Posted in Reviews.Tagged Charles Kruger, circus, san francisco bay area theatre reviews, Sean Taylor, The Soiled Dove, theatrestorm, Tortona big top, Vau De Vire Scoiety.